Body Transformation: Get With The Program! Andrew was determined to get fit without a gym. His little hometown didn’t cater to fitness, but he didn’t care. He researched new and creative ideas and implemented his own plan! Name: Andrew W. Harris Jr.
My most recent transformation began in March of 2008. From August 1999 to July 2006 I was living in Syracuse, New York, attending Syracuse University pursuing a Ph.D. in Counseling and Human Services. While pursuing my doctoral studies, I took advantage of the free gym facilities for faculty and students and began getting back in shape. Starting in 2000, I lifted heavy weights, combined different types of cardio, and watched my diet. Before I left Syracuse, however, I allowed financial problems and other worries to take their toll and let myself go again. By 2005, I was in horrible shape again. I tried desperately to find a job that would allow me to meet my needs and finish my doctorate, but was unsuccessful. By the spring of 2006, with no job prospects or graduate school funding (in spite of a 3.76 GPA), I had to return home to Waverly, Virginia. I returned home in the summer of 2006 after losing almost everything I worked so hard for, including a career in academia, the vast majority of my material possessions (e.g. books, clothes, furniture, electronics), and a great deal of my self-esteem and confidence. Much of the remainder of 2006 and 2007 was a huge pity party for me. I worked various jobs, but never seemed to find a proper match. This caused further feelings of depression and failure. I ate and drank like a mad man. 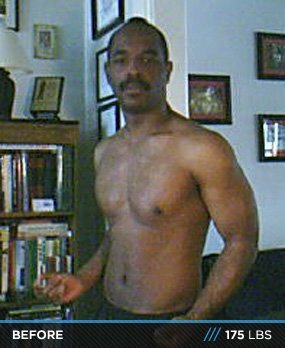 By the time 2008 rolled around, I was up to 175 pounds. I suffered headaches, mental brain fog, physical exhaustion, sleep troubles, and aching joints. I knew I had to get in shape. There were a number of barriers I needed to overcome. The most important was my attitude. I grew used to the free university gym facilities and commercial gym memberships. In Waverly at the time, there was no local gym. The nearest gym was 26 miles away. Between gas, gym fees, and travel time, there was no way that I could join a gym. Once I accepted this fact, I began to think about other ways to get into shape. I managed to bring some workout equipment home from Syracuse - two 20-pound dumbbells, an exercise ball, and some push-up bars. This wasn't enough to achieve the health and fitness goals I envisioned. I heard about bodyweight and began researching different techniques. I knew about the classic bodyweight exercises (e.g. push-ups, squats, crunches). I learned quite a few new variations of the old exercises and some new ones. Having done the research, I decided to use my dumbbells, bodyweight, and cardio to begin getting back into shape. Having completed my research and selected bodyweight and dumbbell exercises, I cobbled together my first six-week workout cycle. I scheduled workouts for five days each week and decided to work out different body parts on each day of the week. I did cardio at the end of every workout. In order to track my workouts and stay motivated, I put the entire six-week workout in a Microsoft Word table that I could print, post, and check off each completed workout. I set my first workout cycle to begin on the first Monday in March of 2008. I started the first cycle weighing 175 pounds, decided not to dwell on the scale, but to use the mirror and how my clothes fit to assess my progress. I didn't take any initial measures of physical fitness. I did 3 sets of 10 reps for all exercises regardless of how easy they were. I increased reps by set increments each week of that first cycle and started walking a mile each day after the workout for the first two weeks and introduced running gradually. I never thought about quitting, but felt very unsure about the workout that I designed for myself. I must admit that I still felt deprived and depressed without a gym. I never stopped researching and came across ways to enhance my bodyweight exercises to add mass. I used a backpack to add weight to my exercises. I changed the pace of my reps and used different positions for exercises. I continued to press forward with the inspiration of my family, particularly my mother, grandmother, nieces, and nephews. I did a great deal of nutritional research and experimentation to determine what works best for me. I tend to eat only when I am hungry, which means I don't eat immediately after a tough workout. I do, however, have to be careful to make sure I eat the right foods because I generally have a busy daily schedule. Some days are given almost entirely to taking care of my parents and their business affairs. On those days, I tend to snack rather than eating well-prepared meals. I can tell when I have had a day or two of poor eating by simply looking in the mirror. I've used intermittent fasting (Google: Brad Pilon) for the past three years to help burn fat and gain better control over my cravings. My training is a combination of mostly bodyweight (pull-ups, push-ups, chin-ups, dips, etc. ), dumbbell exercises, and various types of cardio. My training regimen is a six-week workout cycle, followed by a two-week "Intercycle" of active rest and recovery bodyweight workouts. Each week of the cycle contains six days of workouts designed to hit various body parts and to address various training goals. This workout as well as my "Intercycle" workout is posted in its entirety on my BodySpace. I stretch before every workout or cardio session. 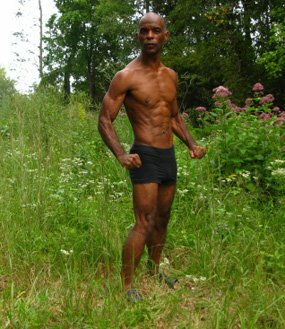 The aspect of my transformation that continues to challenge me most is keeping the workouts fresh, balanced, and productive because I rely heavily on bodyweight and dumbbell exercises. I continue to research new exercises and variations on old exercises. I introduced Tabata-styled workouts, found them challenging, and welcomed them to my regimen. Another addition to my training has been a thorough stretching regimen. I spent most of 2012 rehabilitating a shoulder impingement injury, which was most likely brought on by the high number of repetitions during bodyweight and dumbbell exercises. I failed to thoroughly stretch my entire body, specifically my upper body. That is no longer a problem. I also found that with lighter workouts my shoulder impingement continues to heal. To earn physical training and nutrition certifications and concentrate on those 35 and older. To find fitness modeling opportunities, especially in media aimed at the 35 and older market. I want to write a step-by-step book chronicling my journey to be used as a training program. To complete a behavior change book that's useful to those who wish to live healthy. To find a competitive outlet for motivation and maintain a high level of fitness. To continue challenging myself to be more fit and healthy and to serve as a positive role model. Assess what you want to accomplish in your transformation. Develop and write down your goals. Make sure you develop a strong support network. Develop a strong time management plan. Make sure to balance all aspects of your life. 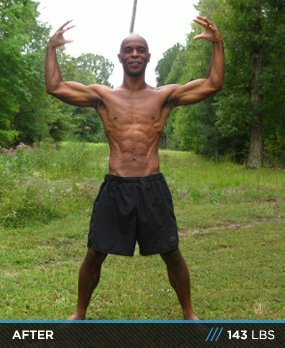 By the time I found Bodybuilding.com in October 2008, my workouts were getting stale. I continued researching new exercises and workouts, but really needed motivation and encouragement. I finally developed the courage to create a BodySpace profile and put up some pretty bad pictures of my progress, or lack thereof, and was surprised at the warm welcome I received. Bodybuilding.com is my primary social network and has been for the past four years. I look forward to checking my "Dashboard" to read my friends' "Fit Statuses." My BodySpace friends helped me through the loss of loved ones, a very painful shoulder injury, and through daily challenges. I encourage any new members on Bodybuilding.com to get involved. If your profile isn't completed, I urge you to complete it and find a network of people.